Golf cart tires can be a confusing product to shop for - with so many variations and styles to choose from, how do you figure out what's right for you? Here are some general guidelines to help you understand the terminology with tires. 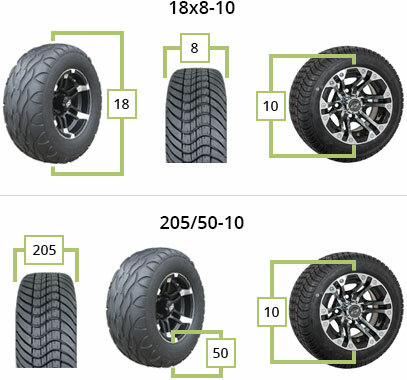 Most tire sizes are in the following format: 18x8-10. The first number, 18, is the full diameter of the tire - how tall it is in inches from top to bottom. The second number, 8, indicates how many inches wide it is. The last number, 10, is the size of the center of the tire - in other words, what size wheel will fit the tire. Therefore, an 18x8-10 tire is 18" tall, 8" wide, and can fit a 10" wheel. Another size format you may encounter is the automotive format, which looks like 205/50-10. In this case, the first number, 205, is the tread width in millimeters. The second number, 50, is the aspect ratio (the side-wall measurement), and the third number, 10, is the size of wheel it can fit in inches. A sawtooth tread has a flatter pattern than more aggressive treads, making it turf-friendly and a smoother ride. It's commonly used by golfers, street-legal drivers, and casual off-roaders. For more extreme off-roading, go with a lug, knobby, or X-tread, as they are more durable and stable. Also, many tires feature a directional tread. If you choose a tire with directional tread, be sure the tread is installed in the right direction! The tread pattern should face the same direction on the driver and passenger sides. 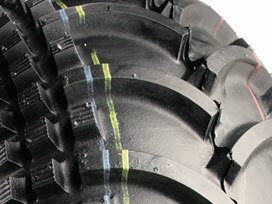 If directional tread tires are installed incorrectly, you may have difficulty steering. Offers the smoothest ride on pavement, and is a popular choice for turf applications. Handles light off-road duty when needed, while also providing a good ride quality on pavement. 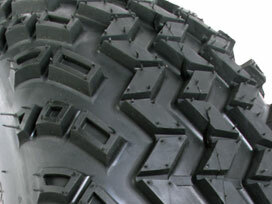 Aggressive tread blocks provide the ultimate off-road performance on muddy or rocky terrain. The wider your tire, the more stable your golf cart will be, because it will have more contact with the ground. Some additional turning force is required when steering wider tires, although it's usually not enough for you to notice. The taller your tires are, the more ground speed you will gain. However, keep in mind that you will lose engine or motor torque. 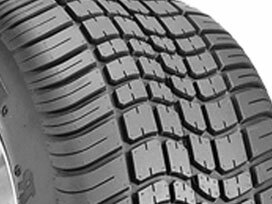 The ply rating is the thickness of the tire, which tells you how durable the tire will be and for what terrain it's appropriate. A 2-ply rating will give you a soft, spongy ride on larger wheel assemblies. A 2-ply tire is ideal for golfers and can be used for light to moderate off-roading - because they're softer, they can absorb more impact, but with extreme off-roading, you run the risk of punctures. A 4-ply tire is tougher and more versatile - it can be used for golfing, street-legal driving, moderate to extreme off-roading, and hauling. A 6-ply tire is often used by extreme off-road enthusiasts, because its extra thickness makes it much more puncture-resistant than 2-ply or 4-ply tires. Still not sure which tire is right for you?